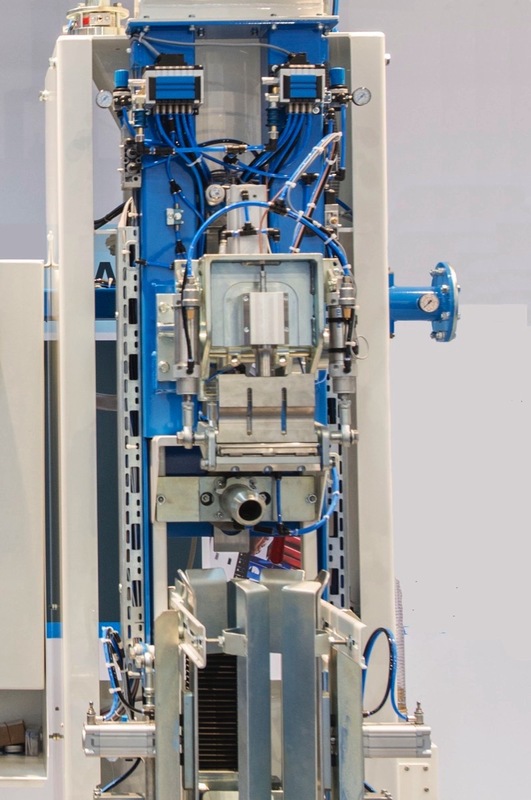 Beckum, Germany – BEUMER Group, a solutions provider for complete packaging systems, is now offering the option to equip the BEUMER fillpac R filling system with an ultrasonic sealing unit. The filled bags have an even better appearance, giving users a significant image advantage over competitors. The BEUMER fillpac R fills bags with bulk construction materials and industrial powders efficiently, gently and with the required throughput. It enables bags of different formats and types, such as valve bottom bags and flat valve bags, to be filled with different materials ranging in structure from very fine to very coarse. To optimise their appearance, BEUMER Group can equip the fillpac R with an ultrasonic sealing unit on request. This is how it works: Before filling, the inflatable sleeve which is mounted to the special filling spout is inflated, preventing the escape of material. When the bag is full, it is automatically pulled from the filling spout and sealed with ultrasound. Afterwards it is very clean and compact. The ultrasonic sealing also ensures that material is not spilled or contaminated during transport by truck. Users can state the filling quantity exactly and do not have to add material later. BEUMER Group is a "bulk-online Leader"
Schenck Process Europe is a "bulk-online Leader"